Our sprays are perfume-free and dermatologically tested, giving you a long-lasting softness that absorbs quickly without leaving your skin feeling greasy. 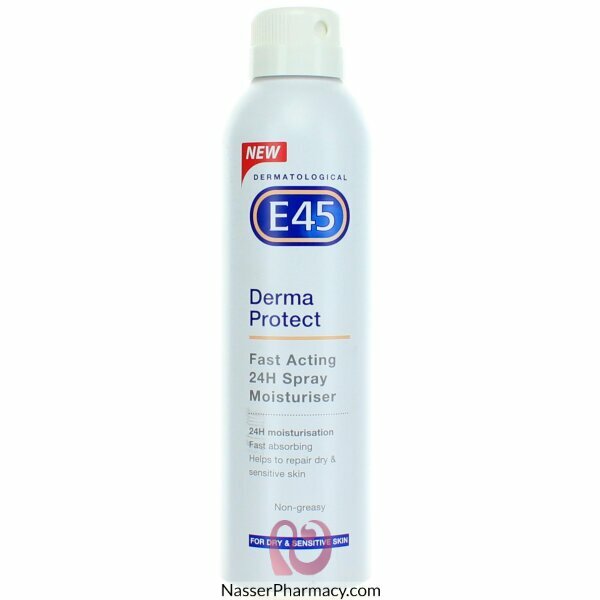 E45 Derma Protect 24H Spray is specifically designed to intensively moisturise and help repair dry and sensitive skin. The formula is suitable for eczema prone-skin and is clinically proven to help retain moisture. Now you can get E45’s expert protection in a spray. Dermatologically tested, it offers 24 hour moisturisation with a non-greasy texture. Apply by holding the can about 10cm away from your skin and spraying all over your body. Smooth over your skin to cover your body. For best results, use daily. Description:Imperfection-prone skin, clogged pores, excess sebum.Complete care with reinforced anti-..